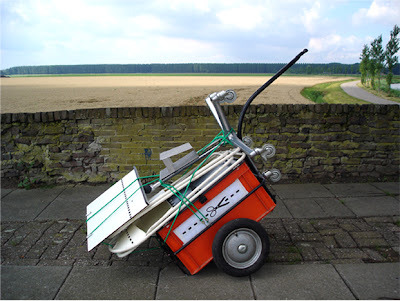 THE STOOP BANK – BIESBOSCH, DORDRECHT. NETHERLANDS. 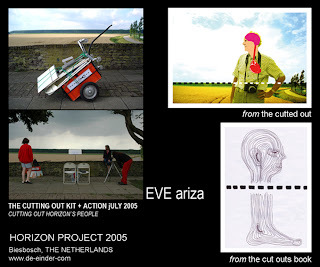 CUTTING OUT HORIZONS KIT: little trailer, photographic camera, tripod, 2 chairs, stand, colour felt pens, book to collect horizons, 2 framed pictures 30 x 42 cm, 2 photograph albums 10 x 15 cm, umbrella. CUTTING OUT HORIZONS AT THE STOOP BANK: In the action/setting-up “Cutouts” which happens from July 16th to July 31st, I cut the horizons of visitors that walk past the Stoop Bank. I propose to the spectator to contemplate the horizon to express directly afterwards what it suggests to him from his/her senses or emotion. The reaction of the spectator results in words or drawings collected in a book called “The cutouts book”, opened on a stand and the only sign on the pages is a dotted line at the same height than the horizon line. The proposal is completed with photographs of persons that result in the series “The cutted-out”. Write or draw your way of thinking the horizon with your BRAIN. Write or draw your way of feeling the horizon with your HEART. Of these compendium results a video untitled “The cutouts book” where the same discontinuous line simultaneously cuts the different horizons of various persons. 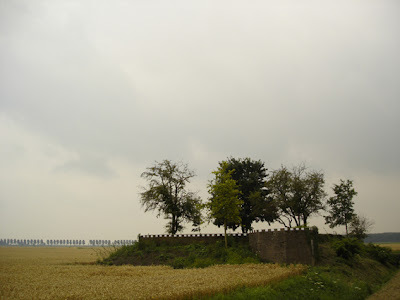 THE CUTTED-OUT is a series of photographs of anonymous contributors, photographed at the same place with the same background landscape and all of them looking at a common horizon. Each portrait is subsequently retouched giving them a rather artificial touch, without loosing completely the identity of the faces, and I add a schematic heart and brain connected to each other on the real ones. The discontinuous line appears at the same place on all the pictures cutting the landscape’s horizon line as well as the figures’ thoughts and feelings. From this series of photographs also follows a video called “The cutted-out” figuring all the cutout persons. The same discontinuous line cuts at the same time the background landscape’s horizon line as well as all the persons. Postcards with images from “The cutouts book” and “The cutted-out” are circulating.